Born in Arnprior, Ontario, Patricia (Pat) had made Calgary her home since 1980, recently moving to Lake Country, BC. 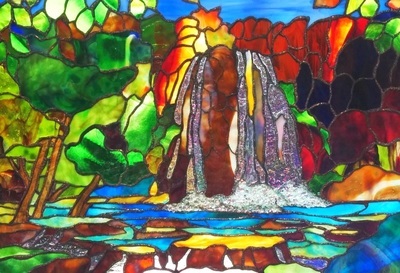 She has enjoyed many years working in healthcare, but now dedicates as many working hours as possible to creating art out of stained glass. She feels privileged to be the mother of a wonderful son Sean, and fortunate to have met Steve who has become her lifelong partner and best friend. Both encourage and support the gift of art she has been given. Pat became interested in art at an early age, exploring knitting, crocheting, ceramics, tole wood painting, among other mediums. But it was the mesmerizing beauty of stained glass in churches that drew her into her current passion. 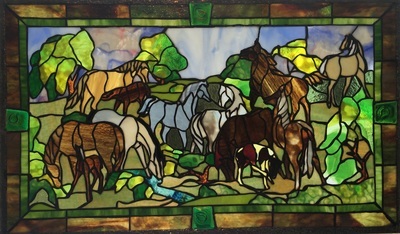 On visits to Europe, Pat became even more fascinated with the stained glass windows of majestic cathedrals. Here was art that was part of the patchwork of Europe hundreds of years ago and still lives in the modern world. Pat's dream to become a stained glass artist came true in 2001, and she hasn't looked back. She has since been commissioned to create custom panels, windows, lamps, mirrors, and decorations for her clients, and also enjoys giving lessons to anyone interested in learning the art. When she isn't in her studio, she loves the walking, hiking, and biking in the great outdoors. Once a piece is given to it's owner, it becomes a lasting expression of life and family that will last through the generations.